In the article and in this interview, Four Arrows describes how the pipeline work has continued illegally despite a judge’s order to the contrary – not the first time that Native Americans have seen their white counterparts ignore their own laws and treaties – and how he and other protestors engaged in a cat-and-mouse game with the pipeline criminals, trying to garner proof of the illegal work. 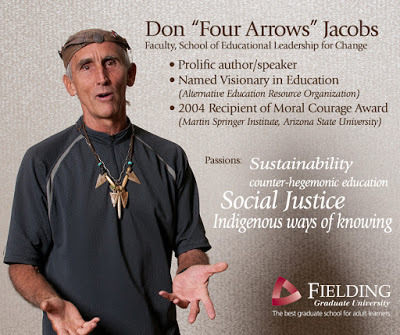 At the end of the interview we discuss Four Arrows’ spiritual journey from his days as a young man in the US armed forces, to his activities today as a politically-engaged scholar and peaceful warrior for truth and justice. TODAY’S SHOW IS A SPECIAL ENCORE EDITION FROM 10/19/2016 as Kevin is on sabbatical. This show was broadcast on November 23, 2016. This entry was posted on Tuesday, November 22nd, 2016 at 6:55 pm	and is filed under Anti-War, Censorship-Propaganda, Climate Change, Disaster Capitalism, Econo, Education, Energy, Environment, Freedom, Health, Human Rights, Justice, Kevin Barrett, Law, News, People, Protest, Spirit. You can follow any responses to this entry through the RSS 2.0 feed. Great show, Kevin, 4 >’s ! -even the bird had a few lines! Was wondering why no mention of global warming’s concurrent, and likely influence/partial cause of – by the daily aerosolizing / chemical dispersion of our planet, also known as chemtrails?? We had a big storm last week in the PNW and the day it approached the sky was completely crisscrossed with the spreading trails, too low to be true contrails… with the daily poisoning of the earth, with the massive amounts being laid out with almost every locality in millions of photos on the net/media,!! – I just wondered why they were not mentioned..